If public art in Pittsburgh had a Facebook page, it would be in a “complicated relationship” with the city — a relationship worthy of a dramatic soap opera script. Last Thursday, the city and the Public Art division of the Department of City Planning sat down to talk. This formal meeting was a post-agenda — called by Councilman Corey O’Connor — that served as an opportunity for the City Council and the general public to hear from experts in a particular field. The issue at hand was “the percent for art law,” formally known as the Ornamentation for Municipal Projects Law instituted by City Council in 1977 as part of a nationwide trend in public art policy. The law was meant to create a formal procedure for integrating public artworks into Pittsburgh projects. If it’s a go, the Art Commission devises an art plan and sends it back to the constructing department, which then decides if it wants to implement it. If it decides to implement the art plan, 1 percent of the project cost will go towards the integration of an art piece. If the department says no, it sends the rejection explanation to the mayor, who can then veto the Art Commission’s proposal. This is a quick recap of a long-winded and extremely contingent piece of legislation. The catch is not just in its complicated procedures, but also in the fact that, in recent years, it has not been implemented. Some of the foremost voices of Public Art in Pittsburgh were gathered round the Council Chamber table. There was Carolyn Speranza, a fierce figure with a commanding presence who began the PGH4ART movement, as well as the tall, gangly and whimsical Diane Samuels, artist and co-founder of City of Asylum. Local artist James Simon and the effervescent Renee Piechocki of the Office of Public Art also came out to talk. Morton Brown, the city’s public art manager, wants to revamp the Percent for Art law, seeing its convoluted process as containing more deadweight clauses than active verbs. “It is not up to national standards. It presupposes that the division in charge knows that the ordinance exists. And it doesn’t give the art commission any final say,” Brown said. Brown has been working on an art plan for the past two years to bolster Pittsburgh’s public art program, only slowing down due to the mayoral election and transition. Now that the new mayor is comfortably in office and supportive of public art, Brown can pick up where he left off. “The art plan is part of a comprehensive plan for the city and the Percent for Art is one of the major tenets of this plan” he said. With activists and artists calling for drastic changes to the city’s art-making policy and politics’ intertwinement with art, Brown hopes that there will be no controversy when his plan for the percent of art law is unveiled. “I hope no one finds it too much like insider baseball,” he said. The meeting itself was not meant to resolve issues, but rather to bring them to light in a public setting. Amidst the art-loving citizens who came to watch were students from Pittsburgh Creative and Performing Arts School, which was, if anything, a statement to the City Council. But the post-agenda was just the boiling point of around two years of percolation amidst the public art sphere in Pittsburgh. It all began much earlier in the Pittsburgh of the 1970s. Pittsburgh was on the cusp of the Steel Mill degeneration, but the art scene was still robust and healthy. City Council integrated public art in its most traditional form, as abstract minimalist sculptures, into construction plans and found presence all over the city. Examples of the “golden age” of Pittsburgh public art include “Light Up!” which used to be in Gateway Center and the Allegheny Landing Sculpture Garden. NPO’s crop of strong municipal infrastructure development and art incentives contributed to the boom. While some public art was created because of the percent for art law, after the decline of the steel industry and development there was less being built and, therefore, less art to make. While Pittsburgh has enjoyed a bit of a renaissance as of late, the law has been collecting dust and virtually disappeared off the radar. In recent years, city government has not implemented the law. It was just the beginning of a long-winded and extremely contingent piece of legislation. 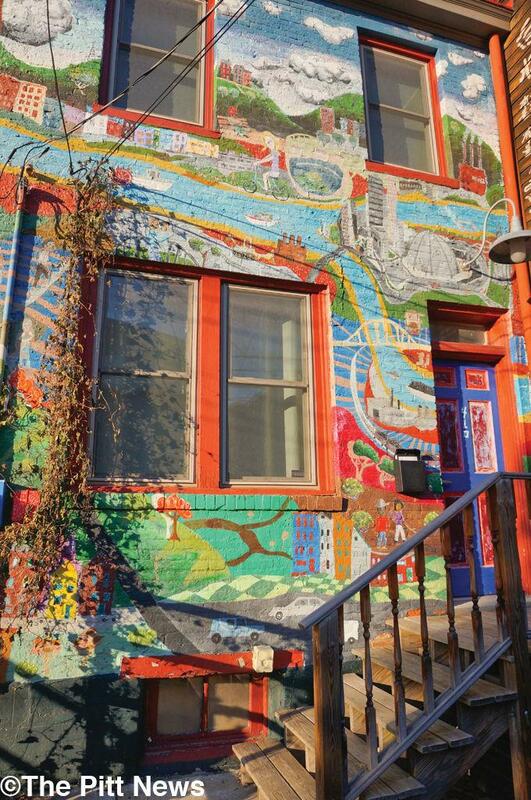 Speranza, an artist and art activist who began the PGH4ART coalition in 2013, wants to raise awareness of not only the percent for art law, but also how public art can impact a community. “Since we use public money, we need to make public art in public space with community input, and give all the neighborhoods a chance. Artists live here and work here, and public art is an expression of the community we live in,” she said. Speranza wants to ensure that the Percent for Art law is consistently exercised, and that when public money is used for infrastructure on city property and an artist is commissioned, they are secure in their commission. Local artists, like James Simon, were also present at the post-agenda, telling both the successes and struggles he has gone through as an artist both in and outside of Pittsburgh. He talked of multiple jobs in other cities that fell through from lack of incentive or even noisy neighbors complaining. Simon argues that art is vital for a city, and that art can bring Pittsburgh into the spotlight, not just regionally, but even nationally and internationally. “As the city begins to do more projects, it is not just supporting artists but is also supporting trade,” Simon said. Public art is complicated, but the supporters of public art, incluing Brown, are determined.